The Dow Jones today projected a 25-point decline in pre-market hours following a report from the U.S. Commerce Department that announced Q2 GDP grew at a rate of 4.1%. The 4.1% figure is the fastest quarterly growth since July 2014. Most analysts are questioning whether the rate of expansion is sustainable. The Trump administration has cut regulations, increased spending, and slashed taxes, all factors that contributed to Q2 growth. However, the U.S. government is locked in a major trade battle with China, one of its largest trading partners, and the U.S. Federal Reserve is reducing its balance sheet at a time that it plans to continue raising interest rates. Earnings season is well underway. And if you're looking to make real money, the time to get started is now. Money Morning Quantitative Specialist Chris Johnson argues the markets are at a tipping point. And with just a few smart plays in today's classic stock picker's market… you can pull in triple-digit gains with just a small investment. Read those picks right here. Energy prices are in focus thanks to earnings reports from Exxon Mobil Corp. (NYSE: XOM) and Chevron Corp. (NYSE: CVX). Shares of XOM fell 4.0%, while CVX shares dropped 2.1%. 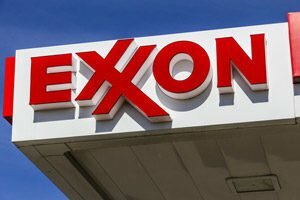 Exxon this morning topped revenue expectations but fell short on the earnings per share (EPS) side of the report. Chevron announced it had beaten revenue expectations and said it plans to repurchase $3 billion in shares a year. The Walt Disney Co. (NYSE: DIS) purchase of most of the assets of Twenty-First Century Fox Inc. (Nasdaq: FOXA) will become official this afternoon. Today, FOX shareholders will likely approve the acquisition. This is a big win for Disney, which outbid Comcast Corp. (Nasdaq: CMCSA) earlier this month. Shares of Amazon.com Inc. (Nasdaq: AMZN) are on the move after the tech giant reported earnings after the bell on Thursday. The stock popped 4.3% to hit $1,887 per share. Although the e-commerce giant fell slightly short of revenue expectations, the stock still popped thanks to news that it doubled Wall Street profit expectations. The firm reported EPS of $5.07, while analysts had projected just $2.50 per share. The firm also said that its Web Services division brought in $6.1 billion in quarterly revenue, a figure that topped analyst expectations by $100 million. Twitter Inc. (NYSE: TWTR) leads another busy day of earnings, and it isn't looking good this morning for the social media giant. Shares of TWTR stock plunged more than 12% after the firm reported that new content rules could limit user growth. The firm did beat Wall Street earnings expectations of $0.17 per share on top of $700 million in revenue. Upcoming content rules suggest that fewer people will be using the site in the future. The news comes at a time that U.S. President Donald Trump accused the company of "shadow banning" Republican lawmakers over their viewpoints in search results. Company CEO Jack Dorsey vehemently denied those accusations in a series of Tweets. Shares of Facebook Inc. (Nasdaq: FB) gained 2% this morning. The stock is trying to claw back some gains after falling 19% on Thursday. The company experienced record-breaking losses after its earnings report on Wednesday. The firm also remains entrenched in an ongoing battle over data privacy and user information. Look for additional earnings reports from Merck & Co. Inc. (NYSE: MRK), AbbVie Inc. (NYSE: ABBV), Colgate-Palmolive Co. (NYSE: CL), and Phillips 66 Co. (NYSE: PSX).